Disaster Management is a combination of environmental, developmental and social issues coupled with administrative directives, operational skills of an organization and its capacities to implement those to lessen the adverse effects of an emergency. The other important constituent of risk management is precise information flow which in itself is a form of disaster response in its own right. May it be a Mexican Earthquake or an 8.7 earth shattering phenomenon at the city of Banda Aceh or the northern tip of Indonesia’s Sumatra Island or Chile or Haiti Earthquake, which leads to eradication of hundreds of lives. Seismic activities occur everywhere and coupled with floods, hurricanes, tornadoes, drought & landslides, they compose a complete chronicle of human destruction. The challenges seem to be more and but it also provides saving options. The risks faced due to any environmental disaster are not only due to losses in lives, environment, health status, livelihoods and assets but also for the services that could occur in a particular community or a society over some specified future time period. 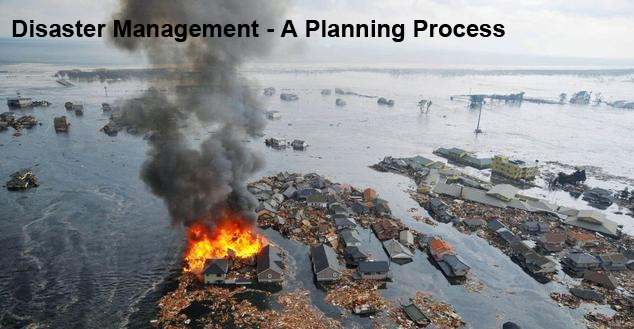 Environmental Calamity Management is a highly complex problem and has diverse manifestations. It is a phenomenon which affects people in different ways and is the result of social, cultural, economic and political factors. It is to be noted that all crises do not give rise to emergencies and the radical changes do not mean that it is always in negative. The vision of the policy makers should be to assist the vulnerable and poor people to bring about positive change and to support their capacity to withstand adverse changes that may affect their social and economic developments. The changes should be made after proper judgment as any changes for the vulnerable people or the communities may give rise to a crisis that may overpower their capacity to cope and hence is an uncalled emergency. Crisis is not only about this unexpected catastrophe but also the sum-up of this slow build-up of political, social, economic and environmental factors. Along with all these issues, there is a combination of unexpected incident such as cyclone, flood, earthquake, drought or any other type of major accidents, which would definitely add to these changes in a very negative way. Hence, it is critical that relief interventions addresses these issue which are the standing parameters for a crisis and which leads to Environmental Catastrophes. It is this inequity and poverty, which make people more vulnerable to the effects of Natural and Industrial Hazards. 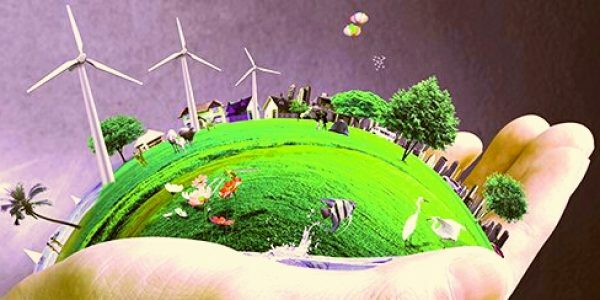 It is a well known fact that Natural Resources are divided into two categories, renewable and non-renewable sources of energy. Human Beings would never lack vital materials if he/she would adjust his population size and resource demands at or below the level that allows the biogeochemical cycles to operate in such a way that materials as well as organizations are “reassembled” as fast they are “dispersed”. The shift from “special interest conservation” to “total ecosystem conservation” helps to establish the fact that human beings are a part of a complex environment which must be studied, treated and modified as a whole and not on the basis of isolated “projects”. Hence there is a need to take cautions while tampering with the Environment with lakes to draining, fillings, dredging, pollutions, stabilizations, mosquito control, algae control and the planting of any fish, which are able to swim. It is we humans, who constrict them with levees and dams and then flush them with dredging, channelizations and floods and silt of bad farming. The other most important factor is proper flow of information. Responding to the Indian Ocean Tsunami Aid Agencies distributed remarkable amounts of relief aid. But despite this, some needy groups were missed. In some cases, aid went to men and the specific needs of women were not met. In others, aid went to dominant social groups, sidelining tribal people and outcastes. Information about them was lacking. The obvious questions are: Does the people in a disaster stricken area get enough information? Do they receive the caution before a natural disaster? Do the people of a country have the power to involve themselves in management of environmental disasters? In a disaster area, there are different types of information: It includes everything from facts to deep understanding & may include lies and deception. It should be kept in mind that gathering data is a one-way process. If one has to acquire knowledge and wisdom, we need to involve and exchange ideas and analyze those in the light of experience, through discussion and interviews or multiple channels of communication. If the disaster victim can recognize an aid agency’s capacity and viewpoints, they can give better advice as how to help them. It is the dialogue than the data that matters. If we analyze the intensity of a cyclone & its destruction, the deaths and damages caused, it would indicate very diverse co-relationship between the economic leader of the countries and the actual loss of the communities. One of the deadliest cyclones- the cyclone Bhola of 1970 in East Pakistan was classified as Category III (maximum wind speed 205 km) and it killed three hundred thousand people while the economic loss was estimated at US$ 86.4 million. If we go back to 2004’s hurricane season at Cuba, the country proved again how effective it is in protecting human life from the worst disaster. It was Hurricane Charley which swept into Cuba on 13th August 2004 where 70,000 houses were severely destroyed and four people died. When hurricane Ivan came to the coastline of Cuba, with greater force, over 2 million people were evacuated but none of them lost their lives. So, how does Cuba do wonders and save lives from the clutches of such horrible hurricanes? They overpower natural catastrophes as they take Disaster Management in a broader sense addressing issues and policies related to environmental sustainability, social sustainability, information flow and channelization of those in masses and also focus on needs for good quality education in environmental disaster management. In Cuba, evacuation orders are mandatory – an important distinction from other neighboring countries. Public transport is provided to get people to shelters. Local branches of Federation of Cuban Women help and persuade reluctant people to accept evacuation, so it is rare that the police or army has to step in. There is a need to ensure that disaster mitigation efforts are not just top to down and is rather based on direct information from the communities. Risk Mapping is about consideration of direct link from the environmental factors, logical responses and changing pattern of tensions and relationships. Social division and inequality effect risks and its management. Hence there is a need to develop a methodology for analyzing conflict, which should be based on drawing up ‘maps’ of causes and can be superimposed on a similar map of responses. The next factor is Environmental Sustainability. When the human population of an area is small, poor land use may affect only the people who are guilty of bad judgment. As the population increases, everyone suffers if land is improperly used because everyone eventually pays for rehabilitation or is now too often the case; everyone suffers a permanent loss of resources. A small example is if grasslands in low regions are plowed up and planted to wheat (poor land use), a “dust bowl” or temporary desert will sooner or later be a result. If the grass cover is maintained and moderately grazed (good land use), no dust bowl will likely to be developed. It is a general observance that good land use planning has come only after human has first destroyed or damaged a landscape. It is just as the saying goes that Human does not seem to understand a system which he did not build and therefore he seemingly must partially destroy and rebuild before use limitations are understood. i) Cluster development: A cluster development of residential housing around village or town centers with each unit separated by broad green belts. ii) By retaining stream valleys, steep slopes, lakes, marshes, aquifer recharge areas, waste disposal areas free from houses, buildings, and other high density uses. Without such planning, there might be no open space, and which would lead to the same kind of urban blight, chronic pollution and social disorder that we now observe in older, unplanned cities. Generally, the short term profits that can be made by exploiting urban land are so huge that it is difficult for people to foresee the socio-ecologic backlashes and overshoots that accompany uncontrolled growth. With the increase in population, food supplies will reduce resulting in increasing prices. In other words, the size and quality of the “environmental house” should be an important consideration and not the number of resources; we can relentlessly squeeze from the earth. A reasonable goal could be to stress on the fact that a third of all land could be under open space use. The dependence of a city on the countryside for all its vital resources (food, water, air and so on) and the dependence of the country on the city for economic resources become so widely recognized that the present political confrontation that exists between the rural and urban populations is obliterated. The next obvious aspects are creation of Sustainable Livelihoods. The real basis for assessing the appropriateness of any type of intervention is an understanding of livelihood systems and the strategies in which people are already engaged, the problems which they face and the ways in which they are adapting to changing environmental and economic conditions. The notion of “livelihood” systems” takes into account the wide range of people’s roles, activities, personal capacities and resources, which make up the way they make a living; and how these elements are related to each other. It is here comes the concept of serving the poor profitability. These are the people who have great needs, but they can’t express their requirements in a way which may matter to markets. Markets seem to avoid the needs as it doesn’t bring profit and hence poor always tend to remain poorer. It is where Government and corporate houses comes into play and try to make a difference. But today Corporate Social Responsibility seemed to break that ‘tax free’ attitude and has come for the betterment of the World as more World Business Leaders tries to come forward with their aim to improve the smaller parts of the globe where their presence is felt. e) Build a partnership for sharing information with communities, local governments, media, telephone companies and Industries. f) Women and men of all ages from disaster affected areas and wider local populations, including vulnerable groups should receive information about the assistance programme and are given the opportunity to comment to the assistance agency during all stages. Its then we could save many number of human lives with minimum causalities.